Not so long ago we picked up some interesting developments regarding Android 7.0 Nougat and Sony Xperia Z5 as well as Xperia Z3+ handsets. Back then, we revealed that Android 7.0 Nougat had just been certified for several Sony Xperia devices, among them the Xperia Z3+, Xperia Z5 series as well as the Xperia Z4 Tablet. However, there was no specific date as to when this OS will begin rolling out to the masses. According to new reports just coming in, the Japanese tech giant has begun rolling out Android 7.0 Nougat to the 2015 Xperia Z5 series. This means that the likes of Xperia Z5 Compact and Xperia Z5 Premium are also joining the party. The update will bring Xperia Z5 devices to software build number 32.2.A.0.372. However, as for now, the OS has only been confirmed to be rolling out to Xperia Z5 and Z5 Premium handsets only. 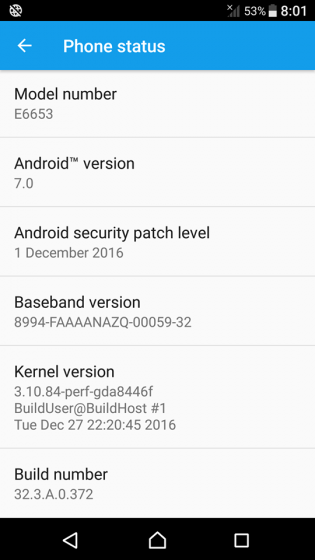 It won’t be long before the same Android 7.0 Nougat hits the Xperia Z5 Compact as well. In addition, the treat should also land to the Xperia Z3+ and Z4 Tablet in the coming days, especially since these devices’ version was also certified along with the Z5. Sony had already rolled out Android 7.0 Nougat to its 2016 flagships that include the Xperia XZ and Xperia X Compact. But it is not the turn of the 2015 flagships to get the same treat, which brings support for all Nougat features as well as the latest Android Security Patch. Be warned that the update, being a major one, is a bit heavy, weighing about 1.3GB. As a result, make sure that your Sony Xperia Z5 or Xperia Z5 Premium is connected to the internet via a Wi-Fi hotspot, otherwise, ensure you get an unlimited data plan before proceeding. Also, make sure that your phone is at least 50% charged or connect it to a power source during the upgrade process.